DO-20005-67 was succesfully added to your cart. These multimeters all feature a 6000-count resolution, display and auto hold, frequency, capacitance, resistance, continuity, and diode measurement capability. Meters include easy battery exchange, closed case calibration through the front panel, and an ergonomic case with integrated protective holster. 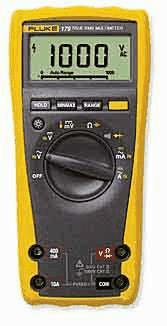 Models 177 and 179 feature True RMS voltage and current measurement capabilities, and provide digital display with analog bar graph and backlight. Model 77 IV also includes average responding AC measurements, and model 179 features temperature measurement capabilities. test leads and one 9 V battery. Model 179 includes a type K thermocouple probe. Fluke 179/EDA2 Electronics multimeter combination kit includes: Fluke model 179 True-RMS multimeter, TL910 fine point test probes, TL224 SureGrip™ silicone test leads, AC280 SureGrip heavy-duty hook clips, 80BK type K thermocouple probe, TPAK magnetic meter hanging kit, and C35 soft carrying case. Fluke 179/1AC-II Electricians multimeter combination kit includes: Fluke model 179 True- RMS multimeter, 1AC-II noncontact voltage detector, case, AC220 long reach alligator clips, TP220 SS probe tips, 80BK type K temperature probe, TPAK magnetic meter hanging kit, and C35 soft carrying case. The Fluke 177 contains its battery in a separate compartment, thus allowing you to replace the battery and not open the case.